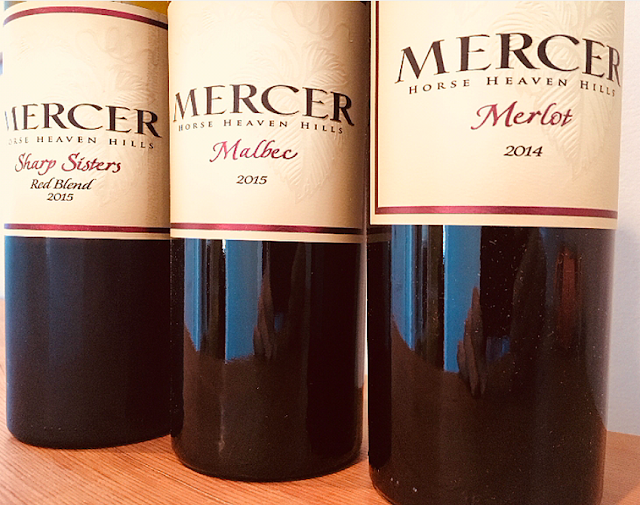 My introduction to Mercer's wines first came six plus years ago. The wines, reds in particular, were impressive. (Take a walk down memory lane here.) In the years since, I've had the opportunity to revisit their portfolio a number of times. Their line up has evolved into different levels, but the core offerings remain intact with most of the grapes coming from the under appreciated Horse Heaven Hills AVA. A sampling of three Mercer reds arrived a couple of weeks ago. Tasting through them, I found myself stymied to come up with fresh words to describe them - that's how blessedly unchanged they are. And as impressive as the consistency of these wines is, that they have remained largely price-stable is a gift to the consuming public. As we head into full-bodied wine season (and the holidays), wise wine lovers will accept this gift without hesitation. Once again, these wines punch well above their weight, delivering terrific drinking pleasure for the money. Wonderfully inviting aromatics, laced with cedar spice give way to an exciting palate packed with energy and rich flavor. The relaxed, approachable texture sits in juxtaposition to the tightly wound fruit. Coiled and poised, this wine is striking now, but will evolve handsomely as the next five or so years unfold. Yet another in a string of Mercer winners. Rich and opaque in the glass and bursting with black fruit and oak spice aromas, first impressions of this imposing wine carry through to the palate where that attack echoes the nose. Chewy and with a good grip, this is high potency stuff that begs for air - and a hearty steak. Classy, thanks to a good dollop of cabernet in the blend, even if it is gargantuan. Same as it ever was, which is to say, fantastically reliable. Inviting with its vanilla-tinged nose, this statuesque, masculine-yet-refined wine exemplifies why Washington state - and Mercer in particular - is at the epicenter of merlot‘s redemption. Highly deserving of your hard earned dollars. Run, don’t walk.